Last Friday I was sitting at the computer working away and I decided to take a break from the dull paces of roster scheduling and fill a few minutes with mindless nonsense the web always offers. For some reason or another I stumbled onto a great site that dissected old Calvin and Hobbes strips and related them to personal meanings. I was so excited that these stories were very much like my own. I could identify with Calvin on so many levels as both an only child and the fact that no matter where I was at present, in my mind I was far, far away. For those who are unfamiliar with this comic strip, it was created by Bill Watterson about a little boy (Calvin) and his imaginary friend (Hobbes). Calvin is an only child who marches to his own beat and has the innate ability to be in two places at once. One for real and the other in his head. His buddy Hobbes, is his stuffed tiger that is real to Calvin and his only friend. Hobbes has an innocent view point on life and is the catalyst for Calvin’s mischief as well as his sensibilities. Together their adventures are endless. While going through these strips on the web I realized that this was such a symbol of my childhood growing up. I read the books on long car trips, Christmas vacation at the grandparents house in Philadelphia, school study hall, and even when we moved to Arizona to escape the loneliness of being the new kid. I never read these books from page one to the end but rather skipped around so there might be a chance that there would be a strip that I missed many days later. But I think the most important memory is with my Dad. He and I would read Calvin and Hobbes books for hours, laughing hysterically at every insightful suggestion Hobbs would give and Calvin would learn, albeit the hard way. I cherish these memories. 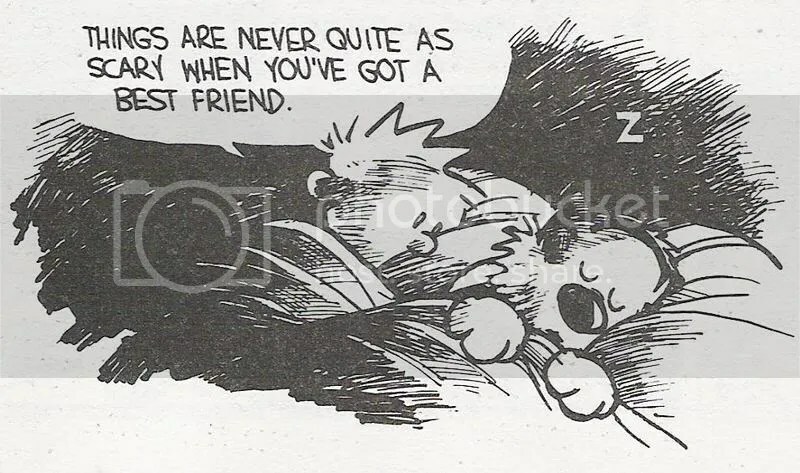 I remember having a worried feeling that the next volume would be the last and Calvin would find friends and he would then see Hobbes the way everyone around him did, a stuffed animal. It’s not that I was entirely concerned for the end of the strip but rather what would Dad and I connect with? It’s not like we would go from comics to reading the Great Gatsby together and discuss the symbolism of dialog between the characters. I just didn’t want to see the end of of our Sundays on the couch. Fortunately, I grew up faster than Calvin. I found friends, played baseball and girls became tolerable. The time reading the adventures of Calvin as Spaceman Spiff became less frequent and soon not at all. I think deep down Dad was worried that this would happen the way it did. He wasn’t as concerned about Calvin’s maturity as he was about my own. I guess all good things do come to an end and nature must take it’s course. The next morning I went to Barnes and Nobel and bought the final volume of Calvin and Hobbes to see how it came to an end. I read the entire book from cover to cover unlike how I did in the past. I wanted to see how Bill Watterson would wrap up the decade long comic and he did it in the greatest way possible. My fears of Calvin growing out of his imaginary friend Hobbes didn’t happen but rather left us with a happy, hopeful ending. It is Calvin and Hobbes walking through fresh fallen snow with their sled exclaiming how it’s like a clean slate. We are left with the two sledding off into the distance with Calvin saying “…c’mon old Buddy, let’s go exploring.” Now I’d be lying if I said I had dry eyes after that. On Sunday I left Ft. Lauderdale and drove to see my Dad at his house an hour north. He was at the kitchen table reading the New York Times drinking his morning coffee just like usual. I sat down with him and opened the Calvin and Hobbes book to show him my latest and favorite stip. He smiled as I slid the book so he could read it. We spent the next hour laughing as we read and without a word we picked up right were we left off 17 years ago. It was a good day. The Simpsons is kind of like to me like Calvin and Hobbes has been to you. The Simpsons has been there since I was 8 years old, and always made me happy and has been there for me. It’s like the Simpsons tells me I know your having a bad day, I’ll help you laugh it off and remind you it isn’t so bad. Take care Billy. What a great post! and what a great comic strip. My dad and I have a similar bond with Archie comics. I still get one in my stocking every year! Dude, I cant lie, I’m a little misty-eyed reading this one.